Tenants across the country have been holding events this week, coming together to tell their personal stories of the importance of living in a home that meets their needs. Habinteg staff and tenants also visited Parliament to meet MPs from across the political spectrum, including the Minister for Disabled People Penny Mordaunt MP and member of the Shadow housing team Melanie Onn MP, to make the case for accessible homes. There are 11.9 million disabled people in Britain and a rapidly ageing society, yet only 7% of homes in England provide even basic accessibility features. 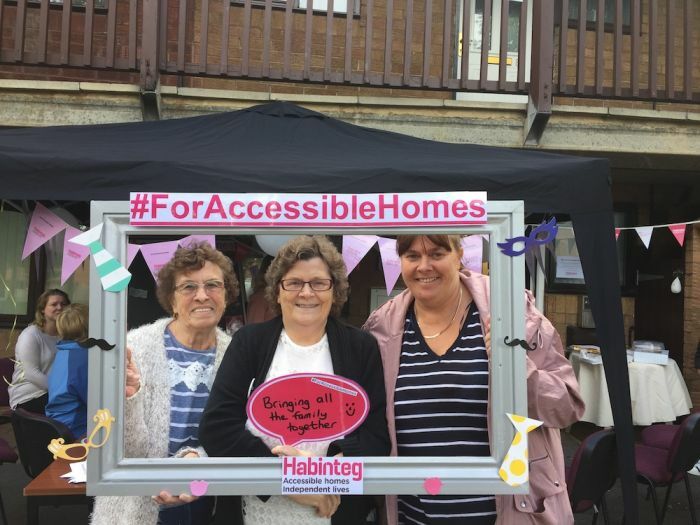 The ‘For Accessible Homes’ campaign, with a day of action on Friday 8 September, aims to raise the profile of the issue and get people talking. Everyone is encouraged to get involved, to help focus attention on inclusion in housing and tell the world why accessible housing is so important. Habinteg argues that it is as important as ever to make the case for accessible and inclusive homes for all. The organisation’s founding belief is that accessible homes can enable people to be independent and be the starting point for inclusion in community life, education and the workforce. Accessible homes can also help public money go further, for example, in health and social care budgets. The lack of accessible homes leaves large numbers of people at risk of social exclusion and isolation. “A home that meets your needs is fundamental to independent living and the ability to take up opportunities in life and adapt to changing circumstances. That’s why the campaign matters. An accessible housing deficit means this is not reality for everyone and we’ll keep making the case to change the situation for the better. Habinteg is a leading national provider of affordable accessible homes and support services. We champion inclusion by providing sustainable neighbourhoods of Lifetime Homes and wheelchair standard properties for disabled and non-disabled people to share and enjoy. We use our expertise to challenge negative social attitudes, promote the rights of disabled people and improve accessibility standards within housing. Be the first to comment on "Award winning campaign calls for increasing number of accessible homes"